Watershed Materials' new zero cement masonry offers a 2,500 psi compressive strength, an improved environmental profile and a beautiful appearance. Director of Technology Dr. Jose Muñoz and Research Lab Manager Taj Easton developed this novel zero­ cement stabilization by combining three different fine particle ingredients: lime, ground­ granulated blast furnace slag (GGBFS) and natural aluminosilicates found commonly in aggregates all over the world. The mix design originated from a collaborative session with Dr. B.V. Venkatarama Reddy, world specialist in alternative stabilization techniques from the Center for Sustainable Studies at The Indian Institute of Science in Bangalore. Lime has a long history as a concrete binder. The Romans perfected the use of an early and very durable concrete that combined lime with volcanic ash to construct roads, masonry, and even complex structures like the Pantheon, the world’s largest unreinforced concrete dome that still stands today. From the top : powdered lime, ground granulated blast furnace slag, and natural aluminosilicates. Lime, as many know, is a very caustic material. It’s highly alkaline - the opposite of acidic - and reacts with all kinds of other materials. Roman concretes worked by using the reactivity of lime to break down volcanic ash into silica and alumina constituents. After breaking down the ash, the calcium in lime then bonded with the silica and alumina to form a very strong C-A-S-H binder that is the backbone to a superbly durable material. Ground granulated blast furnace slag is a byproduct of steel manufacturing that has many chemical similarities to the ash that the Romans used in their long-lasting concretes. The highly alkaline lime also breaks down the chemical structure of blast furnace slag and, similarly to Roman concretes, the calcium in lime then bonds with the aluminas and silicas in the blast furnace slag to form a strong C-A-S-H binder. Natural aluminosilicates are a fancy term for the rock dust and clay minerals found abundantly at aggregate and stone quarries all over the world. This material, like blast furnace slag, is normally thought of as a waste product - quarry operators use huge amounts of water to wash rock dust and clay minerals out of quarried rock before it goes on to become concrete or dimensional stone. Many quarry operators have no use for this material, and the giant piles of it, known as quarry overburden or pond cake, are expensive to haul away. Watershed Materials has always sought to use the fine particles of rock dust and clay minerals as an advantage rather than washing it out, and this mix design does exactly that. The research team discovered that the natural aluminosilicates found abundantly in quarry overburden offers another important source of aluminas and silicas for lime to break down and form new bonds. With this mix design, Watershed Materials is able to turn industrial and mining waste into a gorgeous durable masonry product that offers improved strength, a lowered environmental profile and a striking appearance. The triple combination of lime, GGBSF, and natural aluminosilicates found readily in quarries around the world creates the foundation for a cement free masonry solution that can be produced today. Watershed Materials’ high compression manufacturing process is critical to the success of the lime, ground granulated blast furnace slag, natural aluminosilicate mix design. The chemical reaction between the elements of the binder are optimized when the particles are forced into direct contact, maximizing grain to grain interaction and eliminating void spaces. The company’s new patent pending custom built high compression block machine and deagglomeration mixers work together to lithify the three components into a kind of man made stone. Raw materials rise up the production line's conveyor belt from the deagglomeration mixer on their way into the high compression block manufacturing machine. The environmental profile of the mix design is still being quantified but offers immediate improvements to cement-based concrete masonry. Both cement and lime are made from heating limestone in a kiln at high temperatures. Cement, however, is produced from kilning limestone at a much higher temperature than lime, requiring far more fossil fuels and baking far more CO2 out of the lime. Using lime in place of cement produces less CO2, both from the lowered fuel requirements and from lowered amounts of CO2 released from the raw limestone. GGBSF is a byproduct of another industrial process and offers a way to turn a waste product to a new use. Lastly, using unwashed aggregate saves water and energy and offers the mining and quarry industry a way to make use of their own overburden, turning giant piles of waste into a valuable resource. The striking snow white, nearly porcelain appearance of these block emerges from the bright white hues of the lime and ground granulated blast furnace slag. The white coloration actually appears during the curing process as the lime reacts with the slag and natural aluminosilicates in the unwashed aggregate. Block curing after manufacturing. The block's white appearance emerges during the curing process. 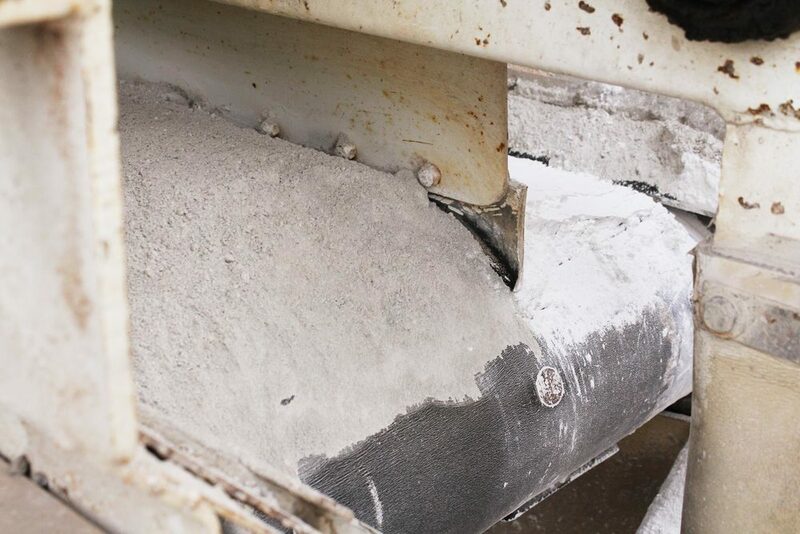 This first zero cement formulation is an exciting milestone, but Watershed Materials is continuing research on its natural geopolymer formulations that eliminate the need for cement while also eliminating the need for blast furnace slag, fly ash, and other industrial byproducts. For all their reuse advantages, byproducts like blast furnace slag and fly ash hopefully won’t be produced in abundance forever, and a solution that avoids their use will have a long lasting impact on the built environment. Watershed Materials’ advanced geopolymer research offers a strategy to produce durable masonry without industrial byproducts like blast furnace slag, however, those mix designs are not immediately market ready. Today, the company is able to offer the market a truly unique and versatile masonry product made with zero cement. 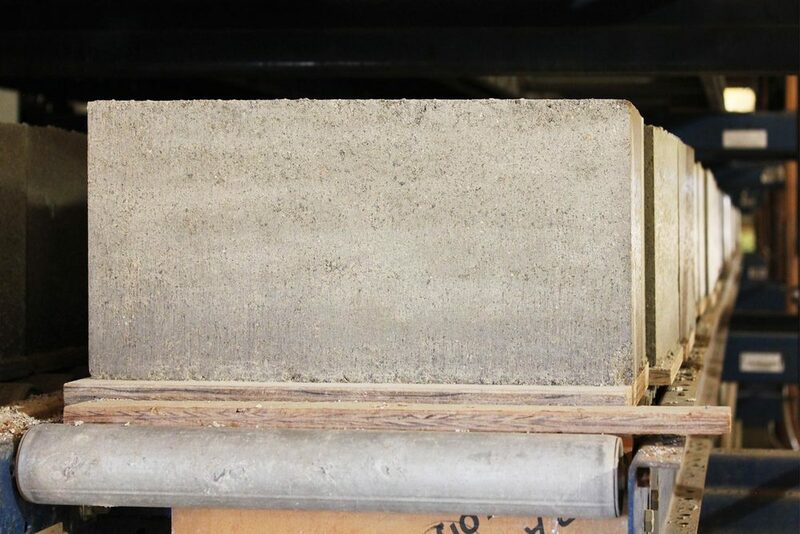 These new block are a giant step forward in the company’s effort to reduce - and eliminate - cement from structural masonry while using regionally sourced unwashed aggregates to offer the construction industry a versatile product that expands beyond the strengths of traditional concrete masonry. Head here for a more detailed technical paper on the new zero cement lime slag aluminosilicate block formulation.